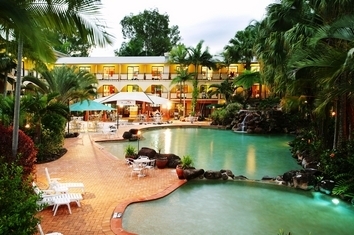 Palm Royale Cairns is designed to suit the Tropical North Queensland lifestyle, provides excellent resort accommodation for international travellers wishing to explore the Great Barrier Reef or the tropical rainforest in Cairns and Tropical North Queensland. Using the best of our local produce, breakfast is served at Beaches Cafe - a perfect place to start your day. The hotel is styled on Mediterranean architecture whilst incorporating classic design influences of the tropics. Combined with contemporary elements of arches, wrought-iron and terracotta tiles with light, airy colours, good quality fabrics and subtle lighting, offering guests a totally unique atmosphere not featured elsewhere in Tropical North Queensland. Surrounding lush, landscaped gardens and tropical swimming pools, Palm Royale Cairns is a 150 room boutique, resort-style hotel with a difference, a home away from home. Mediterranean at heart, the combination of first class facilities and warm, friendly service make it the perfect escape or ideal base from which to discover the region's natural wonders of reef, rainforest and outback. Relax in the tranquil, resort style surroundings and laze by the pool all day. By night experience a whole new atmosphere when the courtyard lights up with a stunning glow of yellow flames. Rates are for 2 adults and 1 or 2 children. Max. occupancy 3. Extra adults $30 per night. Family rooms contain 1 king bed & 1 single bed, or 3 single beds. If airport transfers are required advise flight details in Guest Comments Field on Booking Form. Rates are for 2 adults and 1 or 2 children. Max. occupancy 4. Extra adults $30 per night. Family rooms contain 1 king bed & 2 single beds, or 4 single beds. If airport transfers are required advise flight details in Guest Comments Field on Booking Form. Rates are for 2 people. Maximum occupancy is 2. Bedding configuration is either 1 King bed or 2 single beds. If airport transfers are required please advise flight details/times in the Guest Comments Field on the Booking Form. TODAY'S SPECIAL DEAL! Rates are for 2 people. Maximum occupancy is 2. Bedding configuration is either 1 King bed or 2 single beds. If airport transfers are required please advise flight details/times in the Guest Comments Field on the Booking Form. Non refundable. Rates are for 2 people. Maximum occupancy is 2. Bedding configuration is either 1 queen bed or 2 single beds. If airport transfers are required please advise flight details/times in the Guest Comments Field on the Booking Form. Our child policy is 0-12 years stay free of charge in existing bedding 12 years and over are charged an extra person rate of $30 per person per night. Maximum of three (3) people per standard room. Palm Royale Cairns is located 6km west of the city (adjacent to Raintrees Shopping Centre) and 8km from both the domestic and international airports. Airport and City-centre transfers are available at a nominal fee. For guests wishing to discover Cairns City, a return city shuttle service operates throughout the day and into the the evening. "Beautiful one day perfect the next" Cairns offers something for everyone from the reef, rainforest and outback for the adventurous or just relaxing by the pool for the not so adventurous - this destination offers it all.